Post-Script: The Typestar prints nice and straight lines and columns of text. The wonkiness you're seeing in the above typecast is because I'm experimenting with using the panorama mode in my iPhone's camera, where you slowly scan the camera across the scene and it assembles a very large image file. But if you're handholding the camera rather unsteadily, as I was, it looks a bit weird. Still, it's better than the results of using the camera in its normal mode, because then it tends to curve the lines near the top and bottom of the image due to pincushion distortion of the lens - which the native photo edit app can't correct for. This is all in an effort to configure a more mobile blogging workflow, independent of my flatbed scanner. Still a work in progress, however. Back to the thermal typewriters. It's been educational using both this Canon and the Brother EP-20, side-by-side. You'd think, because it has a much better keyboard and printing quality, that the Typestar would "mop the floor" with the Brother. But the EP-20 is smaller & lighter, with an integral clamshell lid and carrying handle, aside from its storage bag; whereas with the Canon I have to use a dedicated laptop bag for carrying around. Yet they're both only going to make "temporary" paper documents, despite the quality appearance of the Canon's output, because thermal paper is essentially not an archival medium. I have thermally printed bookstore receipts jammed into paperback books I've purchased decades ago and, though readable, they're mostly faded away. It reminds me of magnetic tape media - it'll last a long time, but not forever. In the case of writing onto thermal paper, the workflow is essentially one of rough drafting, getting those initial ideas down on paper, to be later sorted and edited, using a more permanent medium, like regular typewriter ink on paper, or some digital media that is, though substantial, not permanent in the sense of forever permanent. It's kind of like the idea in photography of infinity focus. It's a theoretical construct, the idea that you can visually focus a scene from infinity. Infinity is a long way aways. I suppose you could argue that nothing's really permanent, it's all gonna burn, given enough time until the sun flares up to a red giant. It just has to be "permanent enough". The value proposition with these small thermal typewriters is that they're much more quiet than a manual typer. Meaning you can go places, use them in public, in ways you can't easily with a manual machine. And they resemble, in form factor, an older-style laptop computer. One with a sheet of paper sticking out. Yes, the printout isn't "archival," but it'll last plenty long enough to go through the inevitable edit phase, to eventually make its way into some digital file. I'm going to do some cogitating in the near future about the validity of these small machines as "real typewriters." I know there are some folk who'd argue that any kind of electronic typewriter really isn't a "valid" typewriter, it has to be a manual machine. I can understand their point, but would also counter-argue that, if a 1950s Smith-Corona Electric is a "valid" typewriter (it's essentially the same as a manual series 5, but with a motor, belts and some drive spindles), then you can't discount a machine just because it's electric. So then what? Is it invalid because it has a daisy wheel? Or a carbon film ribbon? What does it matter, really; as long as it prints directly to paper - even if the paper's thermal paper - it's a typewriter, right? Both of these machines use D-cell batteries, and also have AC adapters for when close to an electrical outlet. But the Canon will also charge Ni-Cad batteries internally, using the AC adapter, which I'm going to test out soon. But I've noticed some evidence of corrosion in the battery compartment, which I suspect is because someone in the past (isn't everything in the past?) kept non-rechargeable alkaline batteries in the machine while it was plugged into the AC adapter, a no-no as per the instruction manual. With the Brother EP-20, plugging in the AC adapter disables the batteries, so there's no risk of damaging the machine. About the thermal paper I use. You can easily get 3-1/8" wide point-of-sale thermal cash register paper, at the big-box office supply stores. And then there's 4-3/8" wide rolls, available from online sellers, more appropriate for poetry. But I really like the 8-1/2" wide thermal fax paper rolls. You can either use the roll intact, or cut it in sheets and carry the sheet around with the typewriter in its case or bag, making for a very portable medium. These typewriters were originally intended to use special thermal-compatible film ribbon cartridges, meaning the machine would transfer the text onto regular paper. Both of my machines have a few such cartridges, but they're no longer being manufactured and are expensive to buy online, as new-old-stock. Hence the reliance on the much more readily available thermal paper, which you can use directly without any kind of cartridge in the machine. And how long do we expect thermal paper to be in supply? As long as paper receipts are a thing, I suppose. And fax machines. Maybe about as long as fabric typewriter ribbons? Maybe. I like my Royal Royalite as an ultra portable device that works well in public. If I use a sheet of that foamy drawer liner stuff, the noise is damped quite a bit and carriage returns don’t cause my coffee to go flying nearly as far. I get a few stares from the clientele at the coffee shop, but that is because of the novelty of the machine, Neo included. 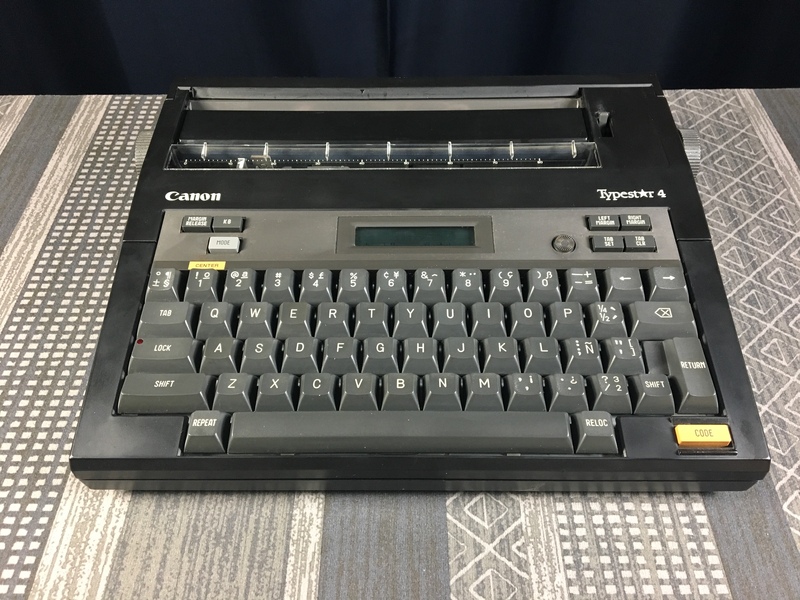 So, to get back to it, I wouldn’t not call call this a typewriter. Call it a more modern version of its older cousin. I do like the way it auto hyphenates words at the end of column too. I like your idea of using panorama view on your iPhone. That is a brilliant idea Joe. Who’d-a-thunk it? As always, I really enjoy your posts. Keep ‘em coming and keep us posted on your progress and experimentation with this machine. Good post. I've been looking at the Typestar, but I just can't bring my self to get another thermal printer. Maybe in the future. I've got plenty of paper to use should I choose to get one. 1) they're still pretty inexpensive to get good examples of, sometimes still in the box. Typewriter collector interest is still very small when it comes to these machines, and they aren't on vintage computer collectors radars other than the few models that can be used as printers, and even then not much. 2) A good set of 4 Alkaline D-cells will power the thing with a significant amount of use for a solid year, so not having a wall wart is no real problem. 3) They can basically be stored in the same amount of space as a thick-ish reference book takes up on a shelf, so having a few around is not a serious storage concern. High-end electronic typewriters were widely used by secretaries in offices for at least fifteen years. There's a reason for that: They were the best writing technology available at the time. Did some searching on EBAY. Saw a lot of the Typestar 5 models. Any thoughts on how they compare?